3: A boat that I can easily trailer to mexico and as I stated earlier - beach launch up and down the Gulf coast. Oh - and I live in Lafayette, LA. Right now I'm leaning towards a Hobie 16 or 18.
i think ... Yes! GO FOR IT! Edited by jalex on Aug 27, 2018 - 04:17 PM. So Jalex - are you reccommending the 18 with wings? Quote So Jalex - are you reccommending the 18 with wings? Depends on your definition of family. A wife and small child? The 16. More than that, the 18. But really I think since you are new to cats get a 16, you can usually sell it for what you paid if you want to move up. Thanks guys - I do appreciate the suggestions and input. May I suggest a prindle? I've sailed a Hobie 14,16 and 18 but I like my prindle the best for handling, hull buoyancy (lower risk of pitch pole). I currently sail a prindle 15,but the 16 has more room for crew. Parts could be an issue, but many parts from other boats can work on the prindle too. Just my 2 cents. Good luck. I was thinking a NACRA 570 all along - will that not be too much to sail with kiddos? Can you dump the power fairly easily? dgoodwyn I was thinking a NACRA 570 all along - will that not be too much to sail with kiddos? Can you dump the power fairly easily? No affiliation, just one to consider. Call Andrew @ the tackle shack in pinellas park. He has a warehouse full of old cat parts. Quote Call Andrew @ the tackle shack in pinellas park. He has a warehouse full of old cat parts. Nacra 570 or 5.7 is a great choice, if I was on the market again I'd choose that one, simple, fast, lot of room on the tramp, you can bring the family (say or 3 adults or 2adults +2kids). No daggerboard= simple + all seats available for the crew. Beachwheels make your life much easier, consider them, they are often part of the deal. Stepping the mast and launching is not necessarily easier on an 18 ft cat, which is what you need if you want more than 2 on board. Another option, more family oriented, less performant but more stable, buoyant, takes more people, very easy to rig: the Hobie Getaway. How much do you weight and what would be your typical and occasional crew? Thank you for your thorough response. I do like speed - it is fun. My crew will be my wife and 2 kids (ages 3 and 6). I grew up sailing at that age and that set me up with a life long passion. 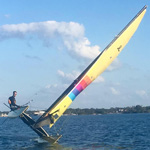 My issue with a monohul is that outside of a sunfish or laser I don't know of any that I can beach launch.. where as the cats seem to be designed to do that with trailer additions like the beach trax that just make it easy. I find a sunfish or laser too small to effectively teach on.. I don't think a 420 or 470 as beach launchable.. am I wrong? The only issue I have with the SKEG hull would be it's ability to point into the wind.. I know that is an issue with cats in general and I feel that a SKEG will only amplifiy that issue - am I correct here? I love to plain and play the waves on monohulls.. but I'm willing to forgo that for a boat that I can launch anywhere.. form a beach or a campsite on a lake. Where I live in S. Louisiana there are almost no sailboat friendly launches and when we do go to the beach in the Florida Panhandle or on an annual trip to San Carlos mexico, a beach launchable option is all that I'll have. Quote The only issue I have with the SKEG hull would be it's ability to point into the wind.. I know that is an issue with cats in general and I feel that a SKEG will only amplifiy that issue - am I correct here? Edited by jalex on Aug 29, 2018 - 02:48 PM.